Sniffing the Past is delighted to present a guest blog from Victoria Shea, a History student at the University of Liverpool. Following the revolution of 1917 that established the Soviet Union, pet dogs were considered to be a relic of a bourgeoisie past and citizens were encouraged to dispose of them. However, eventually dogs returned to their role in society as “man’s best friend” as communist dogs. These new dogs were expected to fulfil a role in society through working as guard dogs, hunters or by pulling sleighs. In the 1950s, Russia began collecting stray dogs from the streets of Moscow in order to send them into space. These dogs were a unique feature of the Soviet Space program, and were chosen for their trainability and character. They were a new chapter in the Russian history of dogs as experimental animals, following on from Pavlov’s famous experiments. However, whilst Pavlov’s dogs were never more than a commodity, space dogs were allocated names and personalities and became famous mascots in both the Soviet Union and the rest of the world. Space exploration became a key aspect of Soviet propaganda, especially as space dogs were some of the first animals to survive space flight. The most famous examples are Laika, Belka and Strelka who have been immortalised in popular culture in cartoons, comic books and writing, although altogether over 40 dogs went to space. Laika was sent into space in 1957 without any provision for her return to earth and she died a few hours into her flight due to a technical fault. Belka and Strelka were sent into space in 1960 and safely returned to earth the next day. In the USSR these canine cosmonauts occupied multiple roles in society as heroes and professionals. As “living proof of the miracles performed by Soviet science and technology” these dogs were paraded in front of press as national heroes and their likeness began to appear on a multitude of items in the USSR. This can clearly be seen in one postcard of Belka and Strelka, where they are shown in a space ship flying above the earth with a banner declaring: “Triumph of Soviet Science”. Belka and Strelka became proof and icons of the utopia supposedly being built in the Soviet Union. 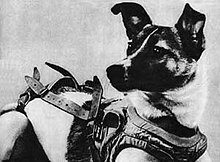 Laika was also represented as a hero, as well as a martyr for scientific progress in the Soviet Union. Laika’s death was incorporated into the idea of dying for the advancement of the Motherland, which was well established in the Soviet psyche, allowing her to continue fulfilling her role as an ideological hero. Perhaps the most popular depiction of Laika is her headshot, which is reproduced on a multitude of items, she is shown as alert and serious surrounded by stars. This imagery is designed to show courage rather than suffering whilst also depicting her as a professional. In the West the space dogs were presented with both sympathy and humour. The New York Times responded to the news of Laika’s suborbital flight in 1957 with a series of dog jokes. There was a repetition of the names by which to refer to Laika as pupnik, woofnik and other variations before finally settling on muttnik. Many of these space dog jokes directly reference the space race, with reports that American science was now “in the dog-house” and that the race was a real “dogfight”. This can be seen as a form of humour in response to fear and paranoia in American press, by belittling the achievement of the Soviet space program with jokes about Laika, they removed the fear of Soviet superiority in the space race. These jokes had the effect of endearing Laika to the people of the west, where it was felt that it was “almost as if Walt Disney had put a lovable mutt into orbit.” Therefore, the jokes about Laika had the effect of creating a loveable, sympathetic character for the public to love. This can be seen directly in a cartoon from Punch artist George Sprod which depicts two dogs watching the news about Laika and referencing the space race, saying “what’s the hurry?” This cartoon blends the theme of space dogs being humorous and loveable with themes of exploitation and experimentation. This love and sympathy directed towards Laika also made her into an extremely effective form of propaganda against the Soviet Union, leading to animal rights protests. Protesters amassed outside of Soviet embassies, with suspected CIA involvement in organizing these protests. Laika symbolized the Soviet regime’s advancement of science at any cost and became a symbol of the price paid by animals. Later sympathetic representations echo this view, such as Nick Abdazi’s graphic novel Laika (2007). It shows how she suffered abuse and neglect before she is finally adopted into the Soviet space institute, where, despite being loved by a worker, Laika’s trust is betrayed and she is sent to space to die. This tragic depiction made it hard for readers to accept that Laika was sent on a suicide mission, leading Abdazi to create several new happy endings for Laika. The most striking ending, perhaps, is one wherein radiation in space turns Laika into something resembling a superhero: Cosmodog, where she then returns to Earth to seek revenge on the scientists who betrayed her. The depiction of Laika as an animal victim of the Soviet Union continues. J. R. McNeill and C. R. Unger (eds), Environmental Histories of the Cold War (New York, 2010) p.13. A. Kojevnikov, ‘The Phenomenon of Soviet Science,’ Osiris 23 (2008), p. 115. A. Nelson, ‘A Hearth for a Dog: The Paradoxes of Soviet Pet Keeping,’ in L. Siegelbaum (eds), Borders of Socialism: Private Spheres of Soviet Russia (Basingstoke, 2006) p. 124-6. C. Burgess and C. Dubbs, Animals in Space: From Research Rockets to the Space Shuttle, (Chichester: Praxis, 2007) p. 62; A. Nelson, ‘The Legacy of Laika: Celebrity, Sacrifice, and the Soviet Space Dogs,’ in D. Brantz (ed) Beastly Natures: Animals, Humans and the Study of History, (Charlottesville, VA, 2010), p.205. A. Nelson, ‘Bringing the Beast Back In: The Rehabilitation of Pet Keeping in Soviet Russia,’ in M. Pregowski (ed), Companion Animals in Everyday Life: Situating Human-Animal Engagement within Cultures (Basingstoke, 2016), p.53. O. Turkina, Soviet Space Dogs (London, 2014), p.97. Postcard from 1961, in Turkina, Soviet Space Dogs, p. 143. Turkina, Soviet Space Dogs, p.14. Matchbox label from 1957, in Turkina, Soviet Space Dogs p.9. The New York Times, 18 November 1957. P. Dickson, Sputnik: The Shock of the Century (New York, 2001) p. 144. N. Abadzis, Laika, (New York, 2007). Reblogged this on Centre for Humanities and Social Sciences of Health, Medicine and Technology. Interesting and thoughtful take on our relations with the dog. Well done!